Every year around mid February, Ensenada hosst a traditional port carnival, this is what port cities do. My parents always used to take us to see the parade in the afternoon and that was my favourite part as they used to get us lots of nice sweet treats, one of them were “Alegrias”, these cosy amaranth bars taste just heavenly. This recipe originated in the state of Morelos, Mexico, there they do these amazing shapes and combinations, but nowadays alegrias are very popular all around Mexico. 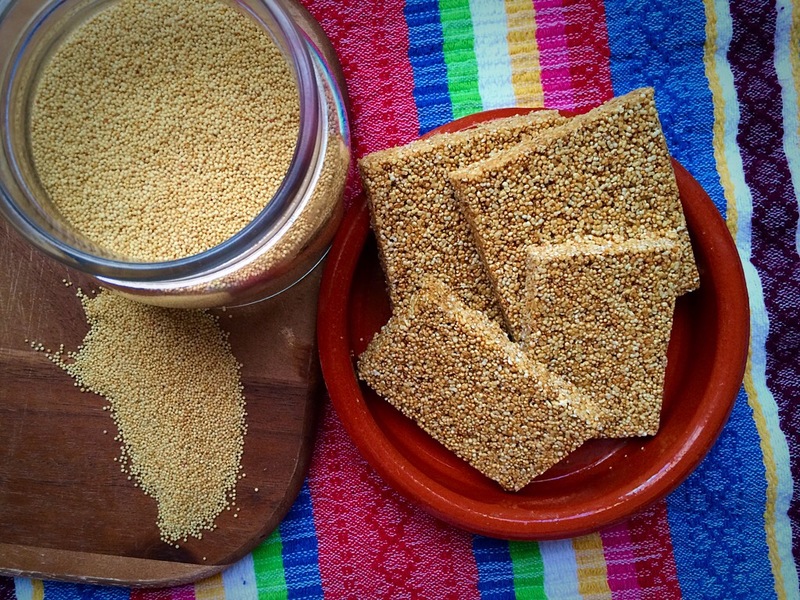 Alegrias are also extremely nutritious, amaranth are the tiny little seed use to make these mexican sweets, amaranth is similar to quinoa and in fact it is as nutritions as quinoa, as it contains high levels of protein. In Mexico amaranth has been consumed since pre-Colombian times, the Mayans and the Aztecs used to eat a lot of this grains as part of their diet and it was consider a very important ingredient. The recipe is an easy to make, you just have to be careful while you are popping the amaranth, because it burns very easily. First pop up the amaranth seeds. Heat a pan with a glass lid, try first with a few seeds to see if the pan has the right temperature. Remember the seeds burn quite easily, that is why I suggest to use a glass lid, so you can see when the seeds stop popping. Do it in small batches, I did one tablespoon at a time. Put the popped amaranth in a separate bowl and reserve. Break all the piloncillo bars and place them in the same pan where you popped the amaranth, add the honey and water and heat until everything has dissolved. Let the syrup to cool down for 5 min. Add the popped amaranth into the syrup and stir vigorously until all the seeds are cover with the syrup. Place the amaranth on a pre-oil tray, I just rubbed a tiny bit of rapeseed oil to avoid the amaranth bars to stick to the tray. Press the amaranth with a rolling pin and let it cool for a few hours. Cut them with a sharp knife in different shapes. You can add pumpkin seeds, almonds, raisins or any other nuts you like.